Aurora Târşoagă and Roxana Rădvan courses. Sunday: visiting the Măldăreşti, Mariţa and Cozia churches. 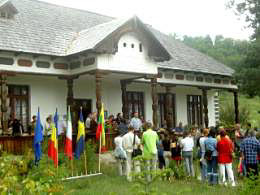 As we already know, also in 2003, Bujoreni Village Museum - a perfect environment in terms of picturesque, formal honesty and spirituality - hosted the fourth edition of the programme Tradition and Post-modernism and the second edition of the Summer Workshops. The opening took place on august 11th in the presence of Mr. Dumitru Stancu, vice-president of Vâlcea County Counsel, Mr. Mircea Gutău, vice-mayor of Râmnicu Vâlcea, Mr. Eugen Deca, director of Vâlcea County ­Museum, Mr. Gheorghe Dican, chairman of the Fine Artists Association of Romania, Râmnicu Vâlcea branch, of Mr. Alexandru Nancu, general co-ordinator of the program and director of HAR Foundation and the foreign partners from Sweden, Italy and Lithuania. At the opening session also attended foreign and Romanian professors and specialists, course attendants and guests, local and central mass media and a numerous audience. The debut of the theoretical section was scheduled for the next day, the opening speeches of professors Alexandru Nancu and Augustin Ioan being followed by three book launches: Myth and Symbol in the Old Testament (“Arhetip” publishing house) by Florin Mihaescu and The Best Ten Architects and Contemporary Sacred Architecture (“Noi Media Print” publishing house) by Augustin Ioan, the launching of the CD Tradition and Post-modernism Summer Workshops – 2002 edition and by the varnishing of the exhibition Levantine Dreaming of the artists Ion Atanasiu Delamare, ­Emilia Persu and Alexandru Nancu – curator, the art critic Luiza Barcan. Before being hosted by Bujoreanu tower, the works had been exhibited at the Institute of Culture and Humanist Research from Venice, Italy. The following two days were almost entirely dedicated to foreign guests from Sweden, Lithuania and Italy, due to their short presence among us. Professors Alexandru Nancu and Augustin Ioan, who presented and explained the scope and perspectives of Tradition and Post-modernism summer workshops, opened the lecture session. Göran Andersson, program manager within Timmerdraget Traditional Construction Centre in Torsta - Sweden and Gunnar Almevik, manager of Arts and Crafts University from Dacapo, Mariestad - Sweden were, for the second time, guests of the summer workshops, fact that proved the interest shown by the Sweden specialists in Romanian cultural heritage in terms of ancient traditions and crafts preservation. Their lectures were related to the detailed research of traditional log constructions within a workshop that unfolded in several European countries, respectively to the attempt to restore and preserve the old crafts and techniques. Lars Eric Jönsson, conservation specialist within the Ethnology department of Lund University – Sweden, talked about the concept of cultural heritage, its political scope and role, questioning its dimension within a diverse society. Also related to the cultural heritage was the interesting lecture of young Eva Löfgren, board member at the Conservation Institute of ­Gothenburg University, who approached the issue of restoring and preserving Swedish dwellings built in the sixties. The next Swedish guests were ­Ulrich Lange, research manager at the National Ethnology Museum in Stockholm, who lectured about landscape as cultural-historical patrimony and Björn Olofsson, inspector in architecture conservation at the Regional Museum in Jamtland, who approached the issue of rural architecture conservation. In the very special atmosphere created by image and information concerning architecture, artefacts and crafts from foreign regions, the lecture of Georgeta Iuga, professor at the Traditional Art and Crafts Academy in Baia Mare – Maramureş, about crafts and craftsmen from Maramureş at the beginning of the 21st century, meant a natural return to our native tradition. 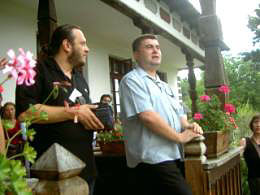 Finally, the last two foreign professors – dr. Rasa Bertasiute, chief architect at Vilnius Village Museum – Lithuania and dr. eng. Ecole Gialdi from Resource Group Integrator – Italy, lectured on the study of wooden architecture as regards construction techniques, form, function and environment, respectively on new methods of patrimony artefacts protection against insects and fungi – Veloxi and Biostop. After the foreign guests’ leaving – the professors from Sweden and ­Lithuania following to take a trip to Maramures – Serban Anghelescu, ethnologist at the Romanian Peasant Museum, talked to the audience (always consisting not only in course attendants but also in teachers and specialists scheduled for the following days) about Traditional Organisation of the Daily, Ritual and Imaginary Spaces. After lunch, in the sultry half of the day, sheltered by the cool classroom with old wooden benches, Carmen Tănăsoiu and Simona Pauncev, conservator and, respectively, chemist at the National Art Museum of Romania, caught the students’ interest with a less familiar theme: Applications of the high-performance scanner in conservation of patrimony objects; ancient manuscripts’ digitising to make a facsimile by scanning. The next day, arch. Augustin Ioan - professor doctor within “Ion Mincu” Architecture and Urbanism University – Bucharest, approached several themes that led to an active dialog between attendants: Ephemeral architecture; Poor architecture today; What are architectural traditions and their current relevance; The archival character of architecture. The day ended with a very interesting lecture of arch. Aurora ­Tarsoaga on the poor status of Basarabi caves complex. The end of the first school week was marked by the lectures at a theoretical but also practical level – a “live” presentation of some special devices – held by dr. Roxana Radvan from the Optical – Electrical Engineering Institute (INOE) and by Victor Coman and Valter Maracineanu, assistants within CERTO – INOE, related to patrimony artefacts investigation, conservation and restoration using laser techniques. 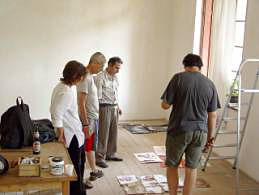 The same day, by noon, most of the artists that were invited to attend the graphics camp – which is part of the practical section of the Summer Workshops – came to Bujoreni. 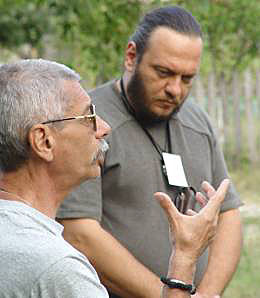 On this occasion, professor Alexandru Nancu – program co-ordinator and Corneliu Antim – art critic and curator of the camp – presented in few words the artists and the general objectives. 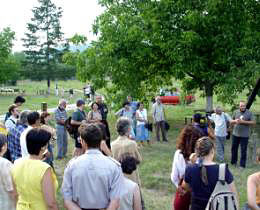 In the evening, the camp opening became, for all “veterans”, an occasion to continue, at a glass of beer and a snack in open air, the discussions on various subjects (discussions that took place every evening at Supca or at Capela restaurant) and for the artists it marked the beginning of a very special experience, filled with strong spiritual values. The second week: Alexandru Nancu, Cătălin Berescu and Rodica Firănescu courses. At the opening of the art camp. Organising the art camp final display. Although the evening extended, for some of us, far over midnight, the documentation trip in Vâlcea County, which was scheduled for the next day, started right on time. We visited the wooden churches from Mariţa, Grămesti and Pietrari, but also the burg churches built by the end of 18th century located at Urşani and Horez Târg. 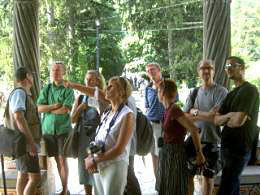 Everybody was impressed by both architecture and mural painting of the edifices. At Măldărăşti mansion, where the two towers and the masonry church were visited, the organisers prepared a special surprise: a lunch on the grass, a real country party with barbecue, tzuica and cold and sweet water from the well. Here we ate, we quenched our thirst and we rested on the incredibly fresh grass. His lectures revealed us the secrets of archaeology, a science as much complex as less studied outside specialised institutions. The young ethnologist Constantin Petre, from Bucharest Village Museum, spoke about the Origin and Evolution of Romanian ethnography. The historian and art critic ­Luiza Barcan relaxed the atmosphere with her lecture about the painting of wooden churches from Northern Oltenia – Ciungetu, Brezoi and Copaceni – in a moral-religious view. The pictures, some of which very comical caught the audience. A very interesting subject related to architecture in traditional literature – Construction Legends and Construction Poetry – was approached by ­Silviu Angelescu, professor at Bucharest Letters University and director of “G. Oprescu” Art History Institute. Already inured to archaeology fundamental concepts, the students learnt, from Cristina Fântâneanu, archaeologist at Vâlcea County Museum, about traditional and modern methods of archaeological research. Tuesday evening ended with a contemporary music concert played by Lucian Spinciu in collaboration with Georgiana Gherghişan. Not only professors, students and artists attended the concert, but also music lovers from Ramnicu Vâlcea; as the seats on the grass required no reservation, they were occupied at once, in spite of mosquitoes’ tireless attack. 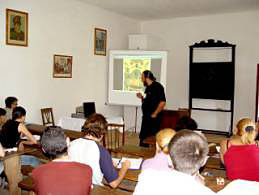 In the following days, the lecture of symbolist Florin Mihăescu referred to hermetism as synthesis of traditional cosmological sciences – From astrology and alchemy to magic and hermetism influence on medieval culture – and Olivian Dulea spoke about Soul Ascension and the world beyond in theological and popular view. 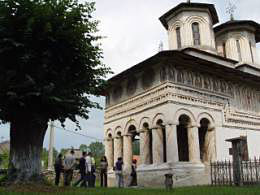 The course of the priest Laurentiu Bozdoc kept within the line of theological field: Sight of God with Byzantine saints, Saint Simeon the New Theologue and Saint Grigorie ­Palamas. Of a great interest were the lectures of professor Silviu Lupaşcu – Paradisiac and aquatic imaginary and Feminine imaginary in Abrahamic religions – and Rodica Firănescu, from the Arabian language department within Bucharest University - Islam, religion of the word: the theological – linguistic view of Az-Zarkashi (14th century) on Koran text. These courses were very new for the students and they led to nocturnal discussions and debates. The lectures that concluded the summer school were held by professor Alexandru Nancu – who talked about Metaphysical aspects of visual symbolic in sacred and traditional arts and about Light as initiation element in eastern ecclesial space – and by arch. Catalin Berescu – who held a very well documented course about the damages, occurred throughout the last communist period: Demolition and memory wiping. The second part of the last day was dedicated to varnishing the creation camp exhibition, to which many art lovers from Ramnicu Valcea attended. The forte point of the farewell party was the cold guitar concert played by Laurentiu Ganea, graduate of the summer workshops’ courses. Maybe because of parting excitement, but definitely due to his exceptional performance, Laurentiu could hardly leave the stage. The symposium continued with the second and most important part of the practical section, concerning the conservation and restoration of the wooden church from Mreneşti Creţeni. The church has been dismantled, restored and rebuilt on a new location: Bujoreni Village Museum.